Since 1984, Consolidated Wood Products has been offering the widest range of specialized wood packaging in our region. Consolidated Wood Products specializes in custom shipping crates, skids, boxes, wood packaging, containers and pallet manufacturing. Located in East Texas we serve all of Texas, Lousiana, Oklahoma and Arkansas and offer the widest range of specialized wood packaging in our 4 state region. We have equipment capable of doing anything to a piece of wood including CNC routing, making no job too large or too complex. 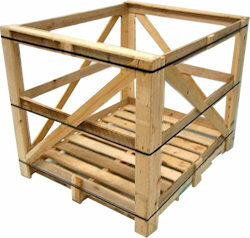 Consolidated Wood Products custom packaging solutions include custom crates of every size, strength, and application. Our ability to build custom size crates lends itself particularly well to parts distribution centers and networks. No size is too large or too small.